International Association of Amusement Parks and Attractions (IAAPA) delegates flew in the Philippines tonight to visit tourist destinations in Manila and Cebu. Enchanted Kingdom joined in the recently-concluded the Asian Attractions Expo 2014 in Beijing, China to further improve the country’s iconic theme park's efficiency, safety and operaations while maintaining the highest standards in the industry. Asian Attractions Expo is a noted international trade show and conference for the multibillion dollar attractions industry. 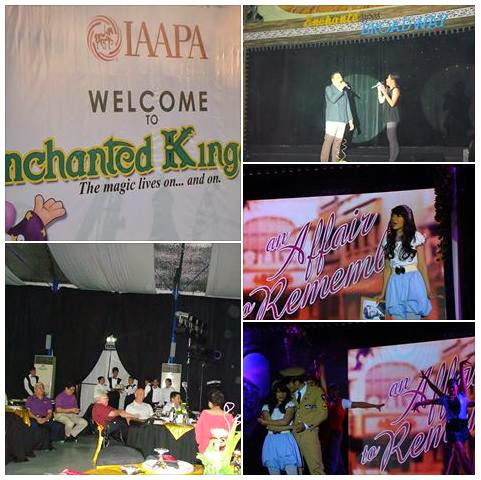 Delegates experienced the promise of "more fun in the Philippines" starting with IAAPA tour in Enchanted Kingdom, the local “Disneyland”. After a magical experience at Enchanted Kingdom, the guest will head off to Mind Museum, American Cemetery, Fort Santiago, Intramuros and Tagaytay City. Said tour concludes the Asian Attractions Expo 2014. IAAPA Chairman Mario O. Mamon and Enchanted Kingdom’s chairman and president welcomed the Delegation at Eldar's Tent last night. IAAPA delegates comprise of attraction industry professionals like theme park owners, manufacturers, suppliers and operators of museums, resorts, zoos, aquariums plus a lot more. It is the largest international trade association representing more than 4,500 facility, supplier, and individual members from more than 97 countries. IAAPA delegates were welcomed by Filipino hospitality. They were treated to dance and stage performances from Enchanted Kingdom's homegrown talents called Circle of Artists while enjoying Filipino cuisine. Awesome Fireworks Display at Enchanted Kingdom delighted IAAPA representatives. The visit is expected to boost Philippine tourism with IAAPA establish partnerships, linkages and networks worldwide. Mr. Mamon said the future of amusement and attractions industry becomes even more promising because of IAAPA’s flagship programs related to safe operations and professional growth thus, he is encouraging more industry players to partake its advocacy. By strengthening country membership in the like of Philippine Association of Amusement and Attractions (PhilAAPA), its members are expecting to benefit from capacity-building in the region through sharing of expertise and resources.